It’s official – Bamboo Manchester has spent 365 wonderful days as Clockwork members at Ziferblat Edge Street! We’ve had a fantastic first year co-working from Ziferblat Edge Street. We still love coming to work knowing that each day will be different – from how the space is used by everyone in it, to the people we meet or the eclectic events constantly going on in the northern quarter’s very own eccentric grandma’s living room. We were actually looking for a fixed office space in the area when we first decided to take the plunge and become northern quarter co-workers. We’d rented an office in Bury for a few years but felt the next logical step was to work more centrally and have a Manchester post code. We decided to start looking at offices in the Northern Quarter and spent a whole morning traipsing around the quirky red brick streets. By the end of the morning, we’d gone from one white washed room to another and hadn’t really felt that lightbulb moment where you think ‘this is our kind of office!’. After what felt like the millionth drab space, we went for a much-needed break and decided to put our feet up and eat some cake at Ziferblat. As we sat in the communal living room café, we watched the friendly buzz mill about the room. People were playing chess, working from their laptops, playing on the piano, and having a good chat over a cup of tea on the balcony. We realised right then that Ziferblat was the sort of place that we’d love to work in. It was the complete opposite to the standard office spaces were looking at. It was brimming with creative character, was friendly and sociable but also had a calm feel about it – exactly what we needed for our web design business! We then bumped into Ben Davies, the Marketing Manager at Ziferblat, who genuinely loves the living room area so much that he works in the open space with fellow Ziferblatters. 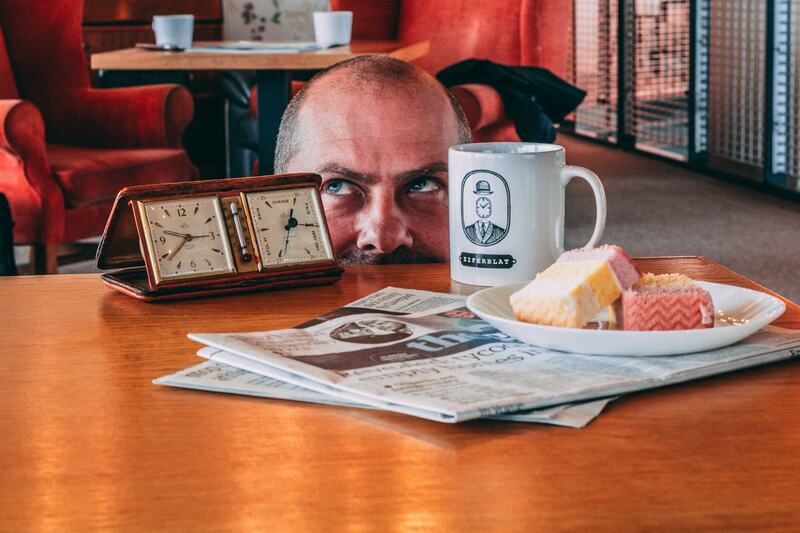 We told him our plight over a cup of tea and he told us about the Clockwork Membership. Sometimes in life those perfect moments just come out of nowhere, and this was one of them. We’d stumbled across not only the ideal space for us but also the perfect office package. We didn’t even realise that co-working would be ideal for us until we walked into the Ziferblat doors looking for refuge from a draining morning. And there we were, happily signing on the dotted line for membership and a Manchester post code. Since we became loyal Ziferblatters, a number of surprisingly brilliant things have happened to us. 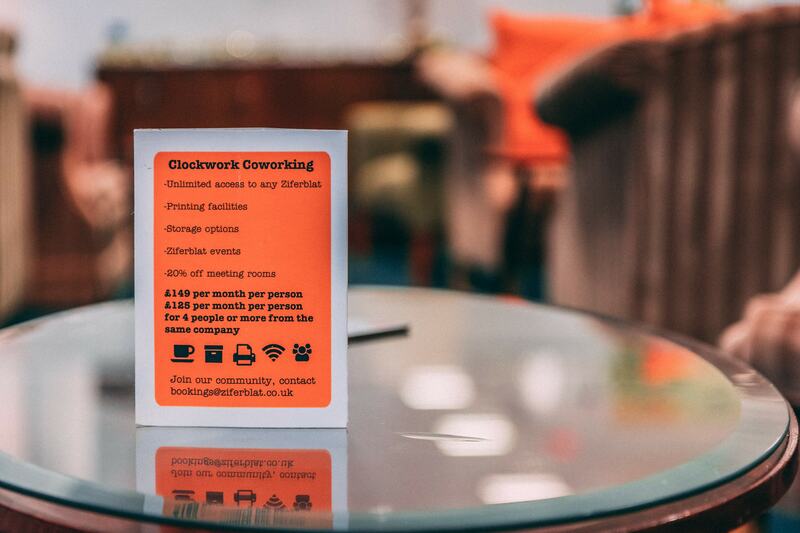 We firstly realised how truly great co-working is and how much it suits what we do. We then noticed a lot of freelancers congregating and eating a lot of cake together on Fridays. Katy Carlisle, who is the founder of Freelancer Folk, welcomed us with open arms and we are now part of her friendly remote worker community. We meet every Friday and not only socialise but help each other out and even work together on projects. It’s what all offices should be like – open, supportive and motivational. We’ve also had the privilege to collaborate with other inspiring people just by working in a space that is social and open to genuine conversation with strangers. We’ve even met new clients by having a good chat in the kitchen, sharing co-working tables or having collective breaks in the sofa areas. We also realised that having the flexibility to work how you want and in whatever type of space you feel like, is helping us be more creative and work more productively. We’ve even branched out into video creation and are working on a rebrand to reflect our Mancunian co-working awakening (watch this space!). In the end, having that break was one of the best decisions we’ve made, not only for Bamboo but also as individuals. It still makes us tremble in our co-working boots knowing that we could’ve missed working here if we hadn’t given in to our love of all things cake!